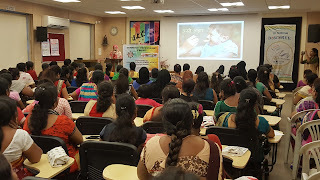 23-Jan-2018, Mumbai: The Don Bosco Development Society (DBDS), Mumbai organized a workshop on ‘Improving Nutritional Status of Women and Children’ at Provincial House in Matunga. 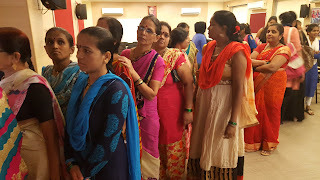 102 women members of Self-Help Groups (SHGs) from different slums participated in this workshop held under the aegis of project supported by Salesian Pastoral Youth Services, Malta. 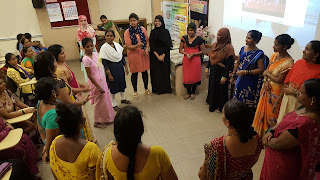 Mrs. Richa Rana (Training Manager) and Ms Syaima (Nutritionist) from ‘Foundation for Women and Child Health’ were the resource persons. 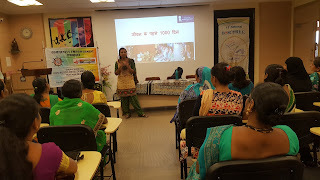 Ms. Surekha Pednekar (Project Coordinator - DBDS) welcomed the resource persons. The resource persons gave detailed information on nutrition and health of women and children to the participants. They further explained the importance of Breast Feeding and proper way to breast feed a child. The resource person highlighted the importance of the first 100 days in a child’s life with respect to Nutrition and Health care. They emphasised the need to supplement the child’s diet with basic food along with milk. It was also explained as to how a mother can make out whether the child is hungry or not. The women were also made aware of the foods which are best for the children during the first 3 years of a child’s life. 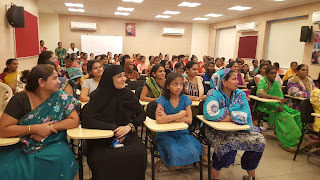 The session was followed by an interactive question - answer session, in which many women asked several questions related to the health of their children. Ms. Surekha Pednekar concluded the topic by explaining the importance of the nutritional and health needs of mother and child and also gave vote of thanks.